Gabe Kapler technically isn’t the first Jewish manager of the Philadelphia Phillies. In 1960, Andy Cohen went 1-0 in an interim managerial role before Gene Mauch took over. Now it is Kapler’s turn, and despite some opening weekend issues, he figures to be there for the long haul. Kapler, 42, is getting his first shot in the manager’s seat, taking over a young club that appears to be on the rise. It is the latest chapter in a baseball career that saw him compile a .268 batting average as mostly a valuable role player in 12 years in the big leagues. He got a World Series ring with the Red Sox in 2004. Kapler definitely will be the first manager who has a Star of David tattooed on his left calf, with the inscription “Strong Willed, Strong Minded” in Hebrew and “Never Again” with a flame and the dates of the Holocaust on his right calf. 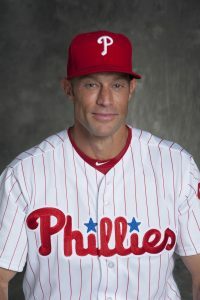 Known for his intensity and a devotee to fitness, Kapler is expected to bring some fresh concepts in guiding the Phillies. While receiving high marks for the way he conducted spring training, admittedly, the regular season wasn’t the best of starts for the new manager. He was roundly criticized for pulling starter Aaron Nola from the opener after only 68 pitches despite dominant stuff and a 5-0 lead over Atlanta. It didn’t help that the Phillies bullpen blew the game. Then in a blowout loss, Kapler summoned a reliever from the bullpen. Trouble was, he had nobody warming up. Listen, it is a long season, and Kapler has plenty of time to make amends. He brings plenty to the table, and if the Phillies are in contention, those first game foibles will be a distant memory. JBM had a chance to talk to Kapler during spring training. He discusses his tattoos, a 2017 trip to Israel with his sons, and his new challenge in baseball. Why did you decide to get those tattoos? I did it when I was in my mid 20s. I feel really proud of my heritage and my bloodlines. It’s not a religious thing for me. I wasn’t religious growing up. This is a way for me to show my pride in where I come from. Our people have been persecuted (for centuries), and there was the Holocaust. Yet we continue to survive. I want to show that connection. In 2012, you were an assistant coach for the Israel baseball team in the World Baseball Classic. What was that experience like for you? I cherished those moments. It was unique. My obligation was to support the players on our team. I really enjoyed learning about the players. Who they are, and where they come from. Kapler in the back row with his sons. In January, 2017, you and your two sons were part of special trip of MLB and future Team Israel players to the Promised Land. What did you take away from that experience? Any time I get to spend with my two sons is special. Having focused time with them meant the world to me. (As far as Israel is concerned), I thought the food was phenomenal. The countryside and scenery were breath-taking. Any time you see buildings and structures that have been standing for thousands of years, it is cool, awe-inspiring. 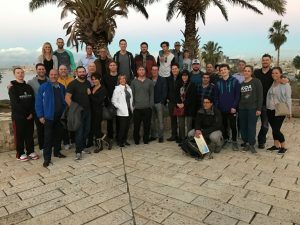 I really enjoyed getting to see the culture of Israel. Getting to see their world and see the people for who they are. I got to learn about them. Israel is such a great story. It is surrounded by countries who don’t like them very much. They want Israel to be wiped out. Yet Israel continues to persevere and thrive. I was awed by the resolve of the Israeli people. Kapler, far right, during a trip to a baseball field in Israel. 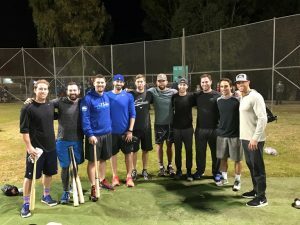 What did you about taking part in activities promoting the growth of baseball in Israel? It was neat to see how baseball is coming together over there. It was powerful to see how invested our group (the MLB players) was in trying support the game. What is it like to be the new manager of the Phillies? It is absolutely invigorating and inspiring. The Phillies have given me the autonomy, support and foundation to thrive. We have built a terrific coaching staff. We have an ownership group that has demonstrated that they are very willing to do what it takes to get us to the next level. Everything feels very good. How do you view your approach as a manager? One of the things that we’ve talked about is we don’t actually build the baseball players, we build the environments for the baseball players to flourish and develop. And if we build a really healthy environment for them to come to the ballpark in every single day, they’re going to be the strongest versions of themselves and then we’re going to carry that strength out on the field and perform. You have been talking a lot about being inspired by the Eagles winning the Super Bowl. Can there be a carryover effect in town to the Phillies? I think the same thing can apply to us. We have an opportunity to shock people. And that’s the message that we’re going to convey. The Phillies were 66-96 last year. What are the expectations for 2018? We have the personnel. We have an organization that supports that initiative. We have young talent that we believe can develop quickly enough to show what they can do. Our goal is to be very competitive when September rolls around, being in the mix, being in the hunt, fighting for the National League East. We want to take a step forward in 2018 and compete for a title.